Aug. 30 was promotion Sunday at Temple Baptist Church in Lincoln. Students were promoted from one class to another based on age. 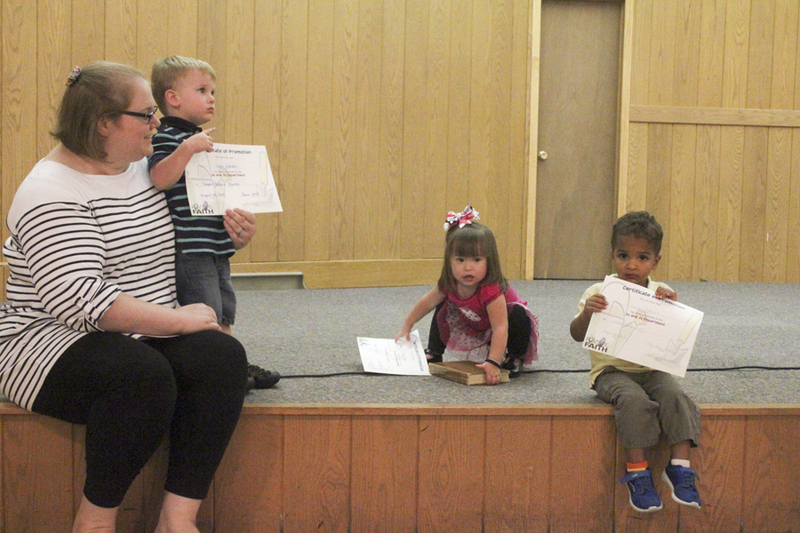 Liam Warden, Eva Clark and Darius Patterson were promoted from the nursery to the 2-5-year-old class. They will join Marcy Penrod's class next week. 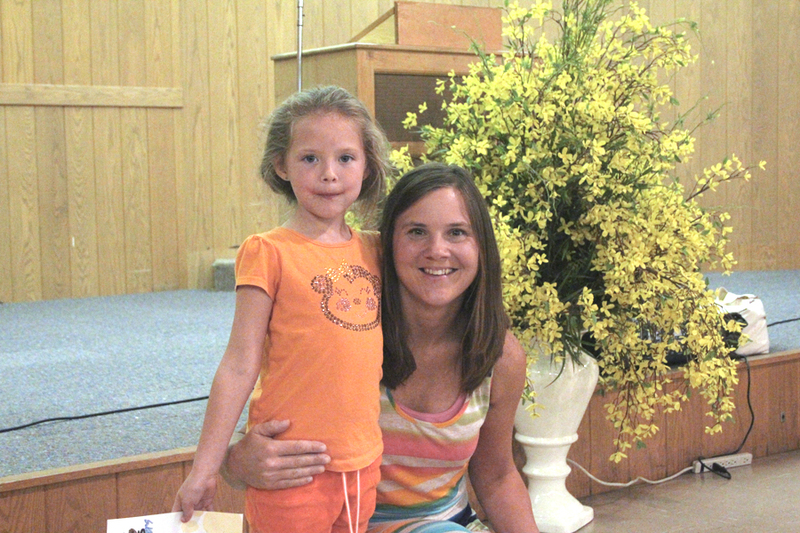 Marcy promoted Emily Wever to the primary class. Emily will now be a member of Sharon Penrod's class. 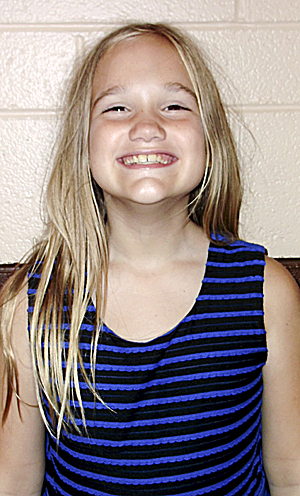 Grace Lanka was promoted from the primary class to the junior class, where she will join teacher Justina Clark. 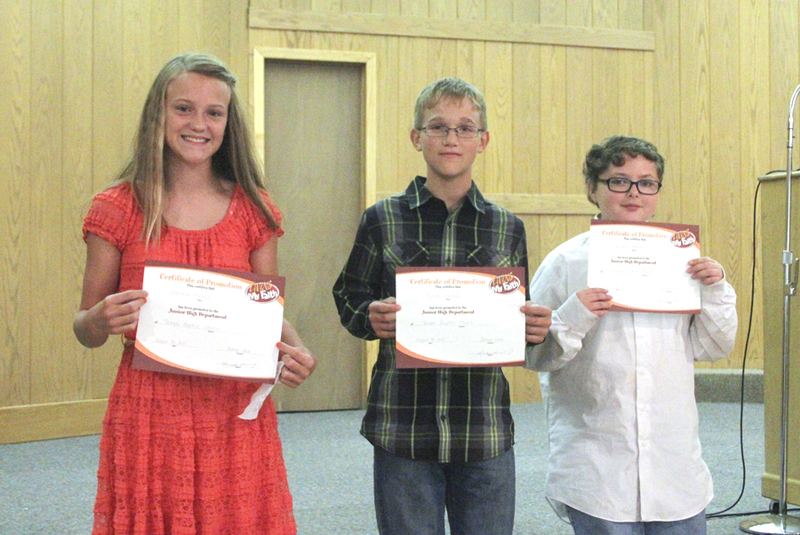 Justina had three students promoted from her class – Trenton Lanka, Brenna Penrod and Hunter Wever. They will enter the junior/senior high class taught by Daniel Bauer. Congratulations to everyone who was promoted. Sunday school begins at 9:30 a.m. every Sunday. Classes are arranged by age for school-age students. VBS Goes "To the Edge"
Vacation Bible School took us “To the Edge” this year, teaching students and teachers about God’s love and power. We averaged just under 100 children, ranging in age from pre-kindergarten to sixth grade. Students spent time daily learning and saying verses, hearing Bible presentations, playing games and eating snacks. We also heard from a quintet of puppets, including Astro the monkey, who were trying to find the edge of the universe. Through all of this, the message of salvation shone through, and a half dozen children responded. Praise the Lord! We finished the week with a carnival, featuring the ever-popular dunk tank. Teens and some of the adults (including Pastor Jeremy and Mr. Mike) took their turns in the tank, teasing the kids as they attempted to hit the dunk button. Some were successful - others were not, but everyone got wet. TBC has just launched our new web site. Check out the new look and new features.